Fortnum & Masons, the famous London department store, claims to have invented Scotch eggs. In the 1730s, Fortnum’s had to create foods to suit its wealthy customers, whose far-flung country estates could only be reached by long-distance coach rides. Portable snacks were in demand, so Fortnum’s came up with a number of ideas, including wrapping a hard-boiled egg – which in those days was probably a pullet’s egg – in sausage meat and coating it in fried breadcrumbs. Substantial, tasty and full of protein, it was an excellent way to stave off hunger pangs. They claim that the name has nothing to do with Scotland; ‘scotched’ was merely another word for ‘processed’. Another explanation is that the recipe originated in the Lowlands of Scotland, and was made by poor farmers who would have kept chickens and pigs. It was a poor man’s lunch produced from leftovers that were easy to carry. 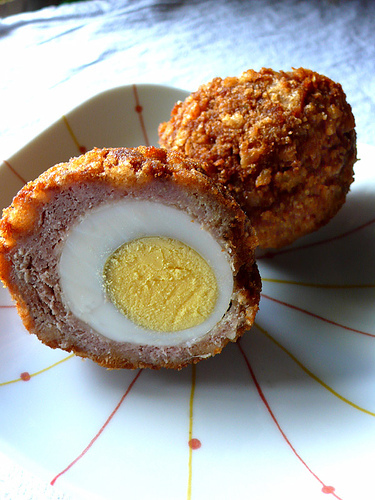 Scotch eggs are can be served hot with gravy at high tea, or cold as a snack. It is perhaps as a snack that they are known best, since Scotch eggs are often featured as pub grub being served with a green salad, piccalilli or pickled walnuts. Also makes great picnic food. My version is perfect for those of us who are wheat and gluten intolerant. Unlike many gluten-free recipes, it actually tastes good. Boil the eggs for 10-12 minutes, then cool under cold running water. Carefully peel off the shells and put whole eggs on one side. Put sausage meat into a large bowl. Add next seven ingredients and work into the sausage meat with hands. Divide into eight equal amounts. Make a coating for each egg. Flatten and then make a patty with the sausage meat. Work it around the egg with wet hands to completely cover with an even layer. Roll the covered eggs in the beaten egg, and then in dried breadcrumbs. Heat the oil to 350-375°F. Carefully put in 2-3 eggs at a time and deep fry for 4-5 minutes until they turn a deep golden color. Turn as they cook so eggs brown evenly. Remove with a slotted spoon, drain on crumpled kitchen towel and repeat with the remaining eggs. Eat cold, halved lengthwise. Beware: Do not try to freeze.